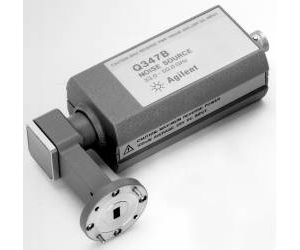 The Agilent Q347B noise source covers a 33 to 50 GHz frequency range. This waveguide noise source allows you to make accurate and convenient noise figure measurements on millimeter-wave devices. The Q347B provides highly precise broadband noise at the input of the system or component under test. The noise figure meter then processes the ON/OFF ratio of noise power present in the system IF, and provides an accurate reading of noise figure and gain. The Q347B noise source has remarkable ENR stability over time, which allows longer recalibration cycles and more accurate noise figure measurements.